This is the best ride ever! 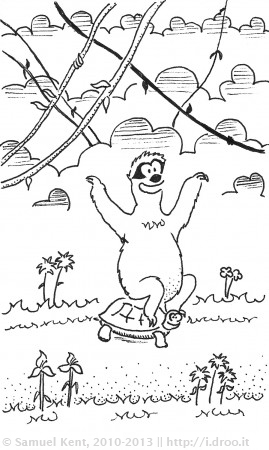 This is the first time I have ever drawn a sloth or a jungle. I am happy with how both came out. Originally, this one was going to be for my nephew Cole. I remembered that Toph has been waiting patiently for a doodle for a long time, and so this one is for him. Also, I really liked this one enough that I didn’t want to let go of it permanently. Sloths are, after all, my favorite animal. Author Samuel KentPosted on June 1, 2011 August 3, 2014 Categories Lunchbox DoodlesTags critters, lunchbox doodles, running, Toph's favorites, TurtlesLeave a comment on #217 — Zoom!